My daughter and I were preparing dinner the other evening and accidentally made the most delicious salmon and veggie slice. Accidental, because we started out by making a zucchini slice, but then changed it up as we went, to use up what we had in the fridge. I'll share the recipe just incase you'd like to try it. Also sharing it for my benefit, so that I don't forget how we made it. Preheat oven to 200C (180C Fan Forced). Line a baking tray with baking paper. Choose a bowl which is larger than you'd expect as we'll be mixing it all through with a fork later on and it can get messy. Grate the carrots, zucchini, onion and sweet potato. Chop up the tomato and spinach leaves. Put all of these together in the bowl along with the flour, eggs, stock, broken up pieces of salmon and the olive oil. Use a fork to mix, mix, mix until it all looks like a bit of a sloppy mess. 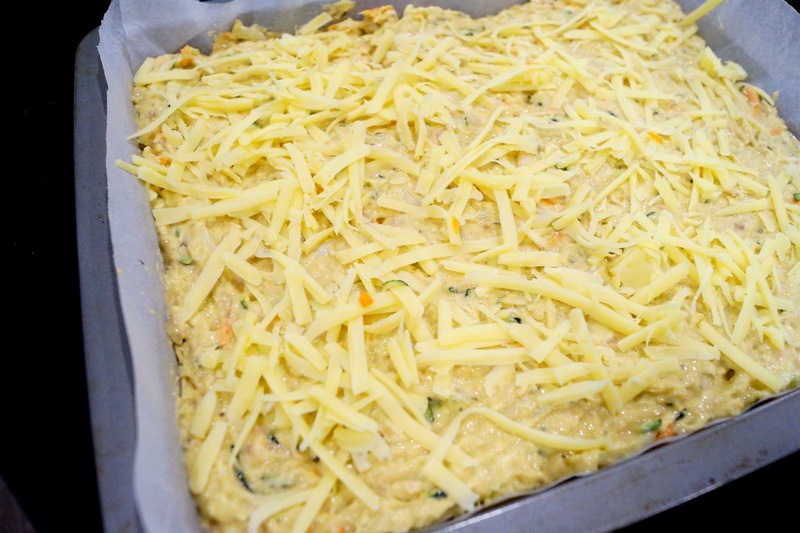 Pour the mixture into the lined baking tray and sprinkle with cheese. Bake for approximately 20 - 25 minutes until the top is golden and the slice springs back to the touch. 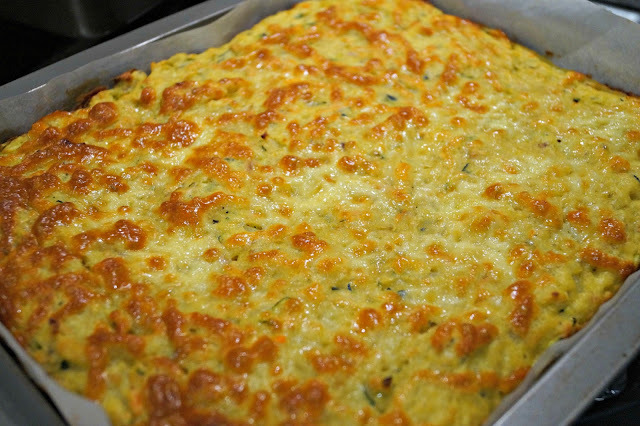 Let it cool before slicing it up into squares. This keeps well in the refrigerator for a couple of days. I haven't tried freezing it, but if you do, let me know how it goes. Throughout Lent, we try not to eat meat on Friday, so this is a great meal which can be prepared a day or two in advance. When I turn the oven on, I have this habit of using it to it's fullest extent by preparing extras, rather than just the meal I'm cooking. I think it all comes back from the ways of my grandmother. She used to bake bread once a week - and when I say bake bread, she'd bake 6-8 loaves to last the family the whole week. Bread wasn't the taboo that it has become in recent years. On bread day, she'd get up early and clear off the kitchen table. She used to knead the dough by hand, the way she was taught by her mother and her mother and her mother... I remember, my gran used to wear this ugly brown scarf with ugly olive green flower prints, on her head, to hold her hair back. It was the bread making scarf, so I guess it didn't need to be pretty. I cannot imagine kneading enough dough, BY HAND, to make that many loaves, but she'd do it... happily humming to herself as she worked. So once the bread was sorted, she'd make cakes (usually meringues), or roast a whole heap of sweet potatoes or trays of dried figs stuffed with almonds (view the recipe). Extra little bits that would last a few days rather than being consumed the next meal. Ahhhh memories... I wonder where that scarf is now? I must ask my mother if she kept it. Do you have warm memories of your grandmother in the kitchen? Love the recipe but when do you add the salmon? Hi Anorina,thankyou for sharing your recipe,sounds very yummy. I am going to try this out. It sounds easy and very tasty. Sounds delicious! Both of my grandmothers passed away when I was still young, but I remember my mother - always an early riser - baking bread. She always wore a light colored kerchief and always had a smile on her face. I later had a white with blue polka dot one, but seldom use it now - as I have a bread machine :)! Yes, wonderful memories! !